One of the things we do (and do well) at Night Shade Books is publish doorstop-thick, genre-defining anthologies. And from Wastelands to The Living Dead to By Blood We Live to The Improbable Adventures of Sherlock Holmes to forthcoming anthologies Sympathy for the Devil and Wings of Fire, it’s been my pleasure to work, in some capacity or another, on all of ’em. A recent anthology that was particularly fun to work on was Tails of Wonder and Imagination, the cat-themed anthology we did earlier this year with Ellen Datlow. After all, it was an opportunity to work with Ellen, an editor that I’ve admired since the days when I would sneakily smuggle copies of Omni (the infamous Penthouse-owned SF magazine) around my ultra-conservative parochial high school, concealing issues, their provocative covers removed, in backpacks and behind other, more acceptable books and magazines. And there are so many great cat stories out there. As we say in the cover copy, “No other creature has inspired so many authors to take pen to page. Mystery, horror, science fiction, and fantasy stories have all been written about cats.” Tails of Wonder and Imagination is absolutely a textbook genre-definer: any modern SF, fantasy, or horror story about cats that matters is included between its covers. But I’m not really a cat person. Allergies are a big part of that. Sure, I’ve had a few awesome cats in my life, including Jones, my orange tomcat named for the cat in Ridley Scott’s Alien, and Angus McKitten (later renamed Paris), a little grey fellow who liked to sleep on top of my head when I was living in Pacific Beach in the late 1980s. But at the heart of it, as anybody who’s met Maddie knows, I’m a dog person. 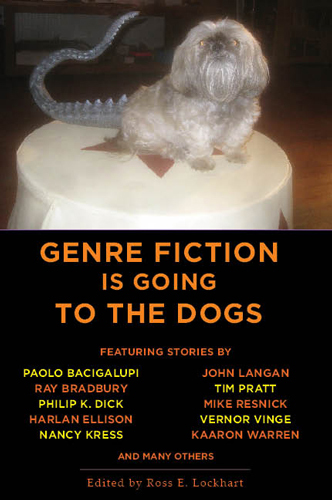 So In the interest of fun and fairness, I’ve put together a hypothetical dog anthology, Genre Fiction is Going to the Dogs, a virtual anthology focusing on the last half-century’s best SF, fantasy, and horror stories about dogs. I’ve modeled this collection on The Fireside Book of Dog Stories, Jack Goodman’s 1943 Simon and Schuster anthology, which included stories by Jack London, James Thurber, E. B. White, D. H. Lawrence, O. Henry, Rudyard Kipling, Hugh Walpole, and Lord Dunsany. Odds are, Genre Fiction is Going to the Dogs will never be anything more than a hypothetical anthology, this is just the product of a few hours of musing and a bit of searching around the web. My intention is merely to share some stories with you. Some will make you laugh, some will make you cry, some will make you mad, but all of them will, I hope, make you think. Please keep in mind that I haven’t secured proper permissions to the stories below*, and that links generally point to online versions of the stories (including podcasts) or to publications where you can find them. And I’m sure I’ve missed some great dog tales, so feel free to make suggestions in comments. * If you are the author of one of these stories, and it improperly appears online, please let me know, and I’ll sever the link immediately. Thanks for the kind words. It was a great antho to work on and I enjoyed working with you on it. You HAVE to have Kij Johnson’s classic, multi-award nominated “The Evolution of Trickster Stories Among the Dogs of North Park After the Change “!